Here come the delicious smells of summer – and gin. 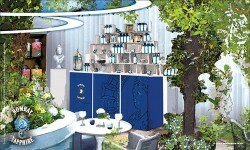 From Friday 24 – Friday 31 May 2013 Bombay Sapphire will be collaborating with The Gin Garden, the creators of travelling gin gardens, to transform the courtyard of award-winning The Hoxton Hotel in Shoreditch, into The Gin Gardenʼs Bombay Sapphire Botanical Experience. Inspired by Bombay Sapphireʼs 10 unique botanical ingredients, the week-long pop up botanical gin garden experience will allow cocktail lovers to celebrate and creatively explore gin botanicals and the much loved ʻGin & Tonicʼ. Timed to coincide with the Chelsea Fringe Festival, The Gin Gardenʼs Bombay Sapphire Botanical Experience will take guests on an imaginative journey of discovery – learning about the intricacies of gin and the opportunity to touch, smell and taste the distinctive botanicals ingredients that have been vapour infused to create the taste of Bombay Sapphire. There will be three experiences to choose from including Ultimate G&T Studio Masterclasses, Gin Botanical Fragrance Sessions, and a bespoke Infused Ultimate G&T Menu for private bookings. On arrival, Guests will be greeted with a Bombay Sapphire ʻUltimate Gin & Tonicʼ served in a special balloon glass and a selection of canapés. The balloon shape of Bombay Sapphireʼs bespoke glass creates the ultimate gin drinking experience by trapping in the aromas from the 10 key botanicals allowing the flavours to linger, resulting in a more intense, fuller flavour experience. Combined with Fever-Tree Tonic Water, Bombay Sapphireʼs preferred Tonic Water, and a freshly cut and squeezed lime wedge, Bombay Sapphire ʻUltimate G&Tʼ is a refreshing and uplifting cocktail for all occasions. Guided by Bombay Sapphireʼs expert mixologist Sam Carter, guests will then learn about the origins of gin and the history behind the much-loved Gin and Tonic. Following this, Sam will invite guests to let their imagination run wild and create their very own personalised G&T Infusion by infusing the classic drink with imaginative ingredients from the specially created ʻBombay Sapphire Ultimate G&T Cabinet.ʼ Guests will leave with a goodie bag, which will include a 50cl bottle of Bombay Sapphire, a Bombay Sapphire balloon glass and recipe card with their chosen infusion ingredients to recreate their bespoke Ultimate G&T with a twist at home. Hosted by Sarah McCartney of 4160 Tuesdays, guests will have the opportunity to blend their own unique scent inspired by the botanicals used in Bombay Sapphire such as calming rose, refreshing lemon peel or invigorating juniper berries. Each guest will be able to take away their own 10ml bottle of tailor-made scent at the end of the session. To apply for Gin Botanical Perfume Session tickets, visit www.gingarden.com Tickets are priced at £35 and include a Bombay Sapphire ʻUltimate Gin & Tonicʼ served in a special balloon glass and a selection of canapés. Guests can reserve tables in the Gin Garden and enjoy three refreshing Bombay Sapphire Ultimate G&T cocktails from the specially created Ultimate G&T Infusions Menu. Ten imaginatively infused G&T cocktails will be available, in addition to a selection of botanical inspired canapés. To book the Ultimate G&T Infusion Menu Private Booking tickets, visit www.gingarden.com Tickets are priced at £25 and include three Ultimate G&T Infusion cocktails from the Menu and a selection of canapés.